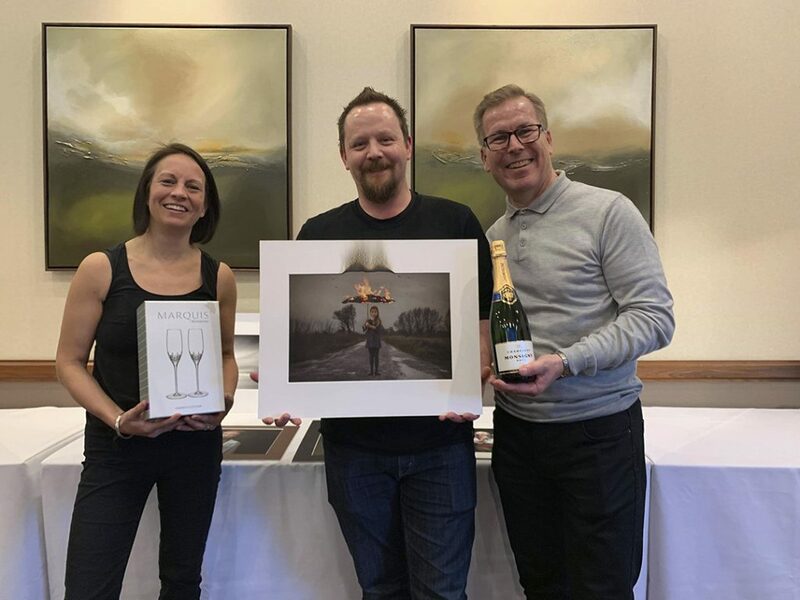 Guild of Photographers 2019 Print Competition Winner! On the 2nd of February whilst Somerset was feeling the chill of the snow, I was in Cheshire receiving my greatest recognition yet with this image involving fire! The Guild of Photographers Awards Dinner at Crewe Hall (a stunning Jacobean mansion) is an annual event which brings together photographers from all over the UK and Europe. The weekend involves talks from a variety of internationally recognised photographers, training events, photo walks and a hotly contested Print Competition. This is only the 2ndtime I have submitted images to be judged in this way with the Guild so coming out on top was a great surprise. Industry experts Saraya Cortaville and Kevin Pengelley said how much they loved the image itself but burning the mount just took it that extra mile. The image was a part of a series of images I started working on last year. Because I predominantly shoot in the studio and with flash, I wanted to challenge myself with creating images outside using only natural light. I also normally create silly upbeat portraits so I wanted these to have a darker mood to them. I came up with several different concepts which I created sketches of before setting off to capture them with my daughter Grace. This was one of my favourites. I had a clear vision in mind for this shot and didn’t want to be using Photoshop flames and compositing images from various places so on a Tuesday morning in the holidays, I headed out on the hunt for a very very quiet road. I didn’t want any houses or buildings looking over where we were as I was worried the fire brigade would be called out unnecessarily and that it has to be said was easier said than done! Even here in deepest darkest Somerset. I didn’t want a car coming past as that was an explanation I didn’t want to have to try to give. 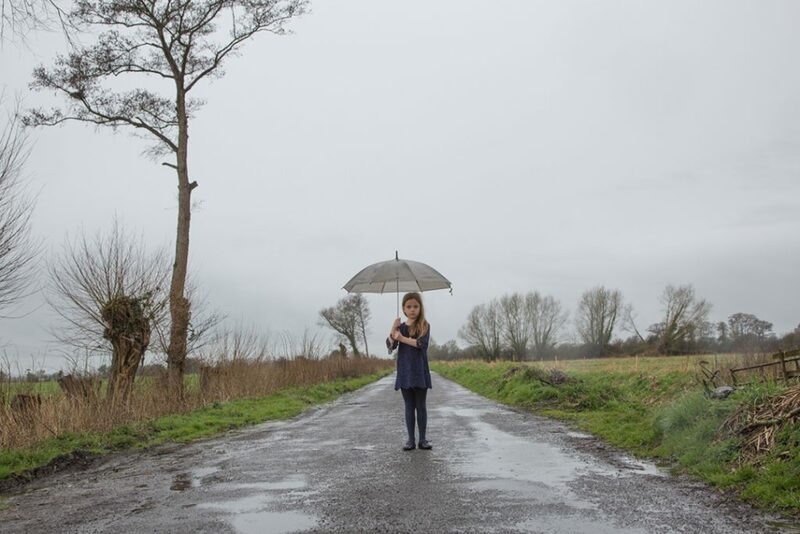 It would also involve moving the camera and the brolly which would make compositing the finished piece together that little bit more difficult so I really didn’t want to be disturbed. I was armed with my camera, a tripod, a lighter, lighter fluid, a clamp stand, 2 umbrellas, my daughter and most importantly a fire extinguisher. Because I was trying to do this during the holidays and when my youngest wasn’t around, we had dropped the little one off at nursery and headed off so the weather was something I just had to accept. I wasn’t too happy it was raining mainly because I didn’t want the camera to get wet so I parked the car in the middle of the quiet country road around Godney and opened the boot. The camera was on a tripod balanced under cover. 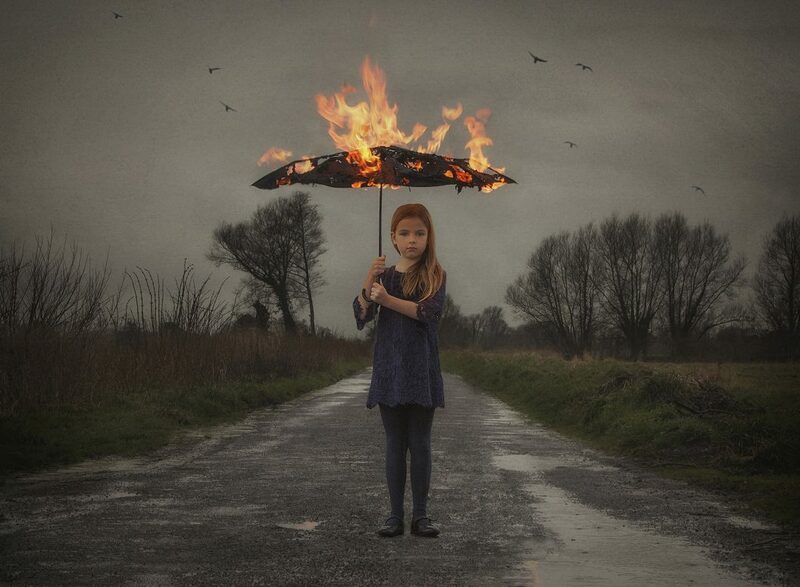 I got my daughter to jump out and have her image taken before placing the light stand in her place and the burning commenced. I must have shot around 30 images of the fire in various forms before there was nothing left to set fire to and we packed up to head home. I had taken landscape images of the scene which had exposed of the sky as I wanted it but the birds had come from a folder of skies I have accumulated over the months (I try to take my camera home every night and if the sky is particularly interesting, there’s a road I take which is quiet and flat so I stop and shoot the sky). This isn’t a photo that’s been inspired by something I’ve seen. It was an idea that I thought of because I wanted to do something new and out of my comfort zone. I’m sure it’s been done 1000 times but for me this was something that came about through sketches and thinking about something unique I could do. I am honestly blown away by the result. I can’t thank everyone enough for their kind words. This has been an incredible start to the year and I only hope I can keep up the momentum.